Ok, let me be honest. I really only care to review this beer because of the picture of me below. Granted, it’s a terrible picture of me as my face look fatter and more wan that it truly is. Thanks bad selfie angle and blaring fluourescent lighting! 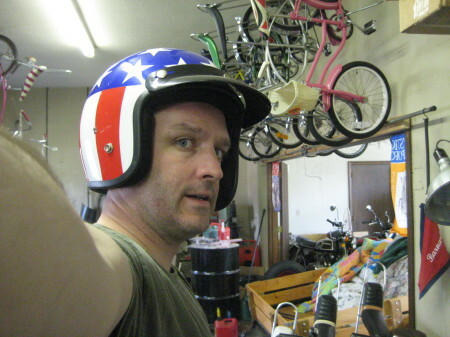 Regardless, that’s me wearing a too-small helmet from the classic American road movie, Easy Rider. And that’s cool. The picture is from the now defunct New England Muscle Bicycle Museum that used to be in Bloomfield. CTMQ crossover! Since I’m just randomly writing stuff, I might as well mention how much I appreciate stores that sell singles. Most do now, but not all of them – and very few still allow it for every beer they sell. Harvest Fine Wines & Liquors in my hometown does just that, and that’s one reason I shop there as often as anywhere. 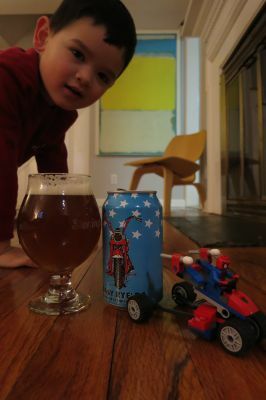 And so, instead of buying a full 6-pack of an unknown quantity like Black Hog’s Easy Rye’Da, I was able to pick up just one can for the purposes of this review, which I mentioned I only wanted to do because I have the picture of me below. I’ll stop before you fall asleep – to the beer! Wow, that’s random. And pretty cool. But are they implying that one could down a bunch of this “low” 4.7% ABV beer and then safely “head out on the highway?” Or am I reading way too much into this? Yeah, I know the answer to that. “Sesson” IPA’s and rye beers were all the rage in 2014, so this beer hit the market’s sweet spot, satisfying both “in” things at once. Black Hog is rather brilliant when it comes to marketing. They had the industry contacts before they brewed a drop and a distribution network from the get-go as far-reaching as pretty much any other Connecticut brewery. It probably helped that they also took over an existing brewery and its equipment, but still, to get where they got as quickly as they got there was no accident. And that’s usually a negative, but in the case of the Easy Rye’Da, it was a positive for me. The beer has a decent citrus aroma and a nice hop bite – accentuated by the rye no doubt – but not much of a rye profile at all. It had a ton of flavor, which I now expect from session beers, thank goodness. So if rye is your thing, you’re going to be disappointed here. If you enjoy a sandwich on rye bread a couple times a year like I do, then it will be a pretty decent IPA. Certainly not a go-to with other true IPA IPA’s in the cooler next to it, but still not a bad choice.